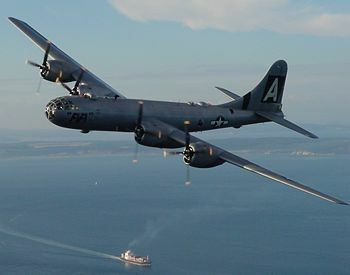 "FiFi" flying over Everett, Washington. The B-29, with the official nickname the "Superfortress" and built by Boeing, was the largest bomber of World War II. It was used by the U.S. for strategic bombing of Japan. The plane dropped the atomic bombs on Hiroshima and Nagasaki. Ruefully, the Japanese called it, with grudging respect, "B-san" (Mr. B). It had limited duty during the Korean War, but was already extremely vulnerable to jet interceptors. Nevertheless, the B-29, and its derivative, the B-50, did feature in early Cold War nuclear plans such as Operation DROPSHOT. B-29s remained in supporting roles for years after, such as weather and electronic reconnaissance, but were obsolete as combat aircraft. The B-29 represented the highest achievement of traditional (pre-jet) aeronautics. Boeing built 3970 planes. Its four 2,200 horsepower Wright R-3350 supercharged engines could carry six tons of bombs 3,500 miles at 33,000 feet (high above Japanese flak or fighters). Computerized fire-control mechanisms made its 12 50-cal. machine guns (and one 20mm cannon) lethal against propeller-driven fighters. It carried a crew of 10, and weighed 140,000 pounds loaded. Since 1941 American strategy against Japan was built around heavy raids against the flimsy, easily burned cities. Plans to base B-17 bombers in the Philippines failed when Japan attacked the airbases and overran the islands. The B-29 had the range to give the Americans the weapon they needed to reach Japan. The B-29 was first deployed from bases in India and China in summer and fall 1944. The result was failure--it was extremely expensive to supply the planes (all gasoline and bombs had to be flown in over the Himalayan mountains), and the Japanese overran the bases in China. The Mariana Islands, captured in June 1944, provided a much better airbase within range of all Japanese industrial centers. However, the systematic raids that began in late 1944 were also unsatisfactory, because the AAF had learned too much in Europe; it overemphasized self-defense. AAF commander General Hap Arnold, in personal charge of the campaign (bypassing the theater commanders) brought in a new leader, General Curtis LeMay. In early 1945, LeMay ordered a radical change in tactics: remove the fire control gear and machine guns, fly in low at night. (Much fuel was used to get to 30,000 feet; it could now be replaced with more bombs.) The Japanese radar, fighter, and anti-aircraft systems were so ineffective that they could not hit the bombers. The B-29s carried incendiary bombs. To counter them the Japanese built firebreaks and installed shutters, but not nearly enough. Fires raged through the 50 largest cities, and millions of civilians fled to the small towns and villages (which were not bombed). Tokyo was hit repeatedly. LeMay sent 325 B-29s over Tokyo on March 9-10 to drop 1665 tons of incendiaries. An unstoppable fire storm burned out 16 square miles and killed over 80,000, most of whom suffocated in bomb shelters when the firestorm consumed the oxygen. One fourth of the buildings in the entire city were destroyed. Half the city's 7.4 million people fled to the countryside (which was not bombed). The raid marked a turning point in the American strategic air war against Japan. Previously, most raids were "precision" raids that used high explosives against industrial targets; thereafter, most raids were "area" raids that used incendiary bombs to burn Japanese cities and kill civilians. The strategic shift did not depart radically from the air war in Europe or from prewar planning. Headquarters had intended since at least 1943 to destroy Japan's cities—and the killing of civilian war workers—as a way to destroy Japan's industrial capability. Although damage to big factories was slight, approximately one-fourth of some 4,000 lesser factories, which operated hand-in-hand with the big factories, were completely destroyed by fire.... Moreover, owing to the rising fear of air attacks, workers in general were reluctant to work in the factories, and the attendance fluctuated as much as 50%. Japanese munitions output plummeted, and by July, 1945, Japan no longer had an industrial base. The problem was that it still had an Army, which was not based in the cities, and was largely undamaged by the raids. The Army was short of food and gasoline, but, as Iwo Jima and Okinawa proved, was capable of ferocious resistance. The 509th Bomb Group was specifically trained for the nuclear delivery missions, which were flown from Tinian. B-29s, and the B-50, which essentially was an upgraded B-29, were the first aircraft assigned to a nuclear delivery role against the Soviet Union. The B-29 was used in the Korean War on strategic bombing missions, but proved too vulnerable to jet fighters. Continuing strategic missions in Korea were flown by fighter-bombers. ↑ Thomas R. Searle, "'It Made a Lot of Sense to Kill Skilled Workers': The Firebombing of Tokyo in March 1945." Journal of Military History 66, no. 1 (2002): 103-133. This page was last modified 11:17, 13 March 2012.